If you haven’t heard, there’s an election in Russia and President Vladimir Putin has already won. Well, Putin hasn’t technically won yet, but he’s going to win, just like he’s won every other sham election during his reign. The results, which will show him winning by a landslide, are not as much the story as the blatant election violations and blocking of serious opposition candidates from running. Western journalists are sharing videos of people stuffing ballot boxes as voters patiently wait in line for them to finish up. Alexei Navalny, Putin’s top political adversary, was not considered a real threat to win an election against the president, but he was a serious candidate who might have given him a run for his money. However, Putin feared him (and his popular anti-government protests) so much that Putin is widely considered to have trumped up politically motivated charges against Navalny so that he would be ineligible to run. Navalny isn’t on the ballot this weekend. Meanwhile, the Washington Post is reporting that the Kremlin fears a low turnout, which would show how illegitimate the election really is. The election coincides with the fourth anniversary of Russia’s annexation of Crimea, a region in Ukraine it took by military force in 2014. 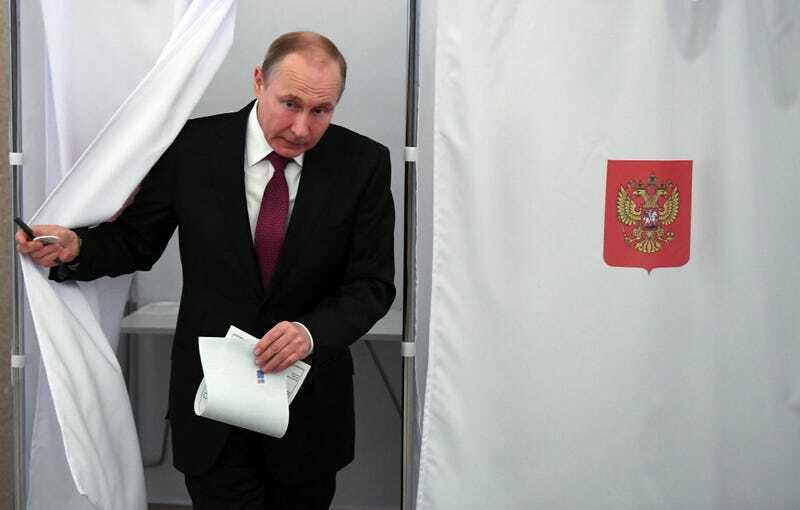 When election results show Putin as the winner, it will mark his fourth six-year term. The only person who has ruled over Russia longer is Josef Stalin.